Baby Alex is what the girls always call him, especially Katie. They sure do love their baby brother! Katie gets so possessive sometimes, especially if someone other than our immediate family tries to talk to him or play with him or hold him or pretty much anything. She starts pulling on his leg and saying that's HER baby Alex and she'll cry and get herself worked up into quite a fit at times. She's funny. I took Alex to Kiddie Kandids a total of 3 times trying to get him to smile cute for birth announcements but this was the best we were ever able to get out of him. I think he was still just a little too young and he wasn't very good at smiling on cue yet. He was about 9 weeks old when we did this. Then a few weeks later when he was exactly 3 months old I took him to Olan Mills for a free little package I had a coupon for and he never stopped smiling the whole time! It was SO frustrating! 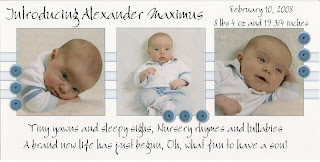 I did actually get some birth announcements in that package, too, but their styles are pretty plain and boring. I probably just need to stop being so picky with it all. =) Here are the results from that time. (Remember, you can click on pictures to view them at full size if you want) I just think he's such a cutie!